The main character of Tao is refreshingly gentle, thoughtful and spiritual. The dragon Kai is a humorous counterpoint to Tao's earnestness. The story is well-written. The first part meanders along, but those familiar with the basics of Tao philosophy will recognise this deliberate pacing in action. But fortunately the story doesn't ever get boring. Rather it is fascinating, particularly in immersing the reader in Chinese history and tradition through characters and action. At times the action becomes truly scary, even gruesome. A very enjoyable story for middle readers, with a sweet heart. So far the Dragon Keeper Series is my FAVOURITE! The books in the series have so much action and detail that I can picture the whole story in my mind. The fact that the story is about protecting dragons, unlike many other books that contain the quest to kill a dragon makes it unique. Katharine is a judge for the Aurealis Awards. This entry is the personal opinion of Katharine herself, and does not necessarily reflect the opinion of any judging panel, the judging coordinator or the Aurealis Awards management team. To be safe, I won't be recording my thoughts (if I choose to) here until after the AA are over. A good ending to the Dragonkeeper series, with a bittersweet note of both finality and uncertainty. This was a good book. It was interesting and moving and scary all in its respective parts. My one annoyance was that the ending seemed a bit slow. 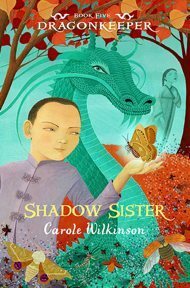 Carole Wilkinson - Carole was born in England in 1950. Her family moved to Australia when she was 12. She now lives in Melbourne, with her husband John. Carole didn't start writing until she was nearly 40. Before that, she worked as a laboratory assistant, working with a lot of blood and brains. Once she’d decided to try and become a writer, she went to university. She wrote a lot while she was there including her first novel. She showed it to a friend who worked in publishing who asked if she could write a teenage novel. Her first published book was based on something her daughter, who was at high school at the time, was doing.Carole says she has lots of ideas and so far she’s never had 'writers' block'. She might have got a late start, but she’s been trying to make up for lost time and has written more than 30 books, some short stories, a telemovie and some TV and planetarium scripts.